← How to add a strikeout font watermark and print PDF via command line? 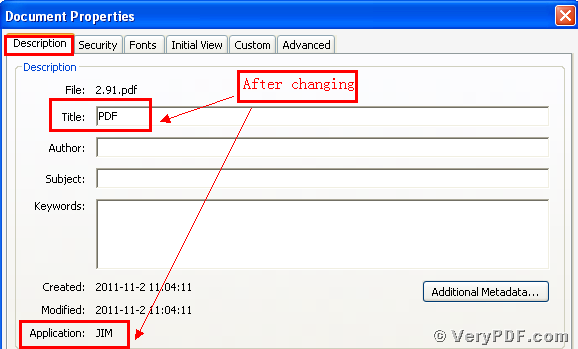 Today I am going to illustrate how to edit pdf title and creator information. I think it is difficult for us to fulfill this process without any software. So which software can be used in this process? How can we edit title and creator information in a convenient way? I tried many times and found that the Advanced PDF Tools is ideal software. It can not only save your time, but also can save your energy. Because it just need a few minutes to fix it. In order to let more people to know how to edit pdf title and creator information, I will put this article here. Hope it can be highly valued by you. Click this website: http://www.verypdf.com/pdfinfoeditor/advanced_pdf_tools_cmd.zip. and download this software, do remember to extract it, for it is a zipped package. Install it in your computer for the future use. The important step is that you need to register, if not some functions of this software are disable. 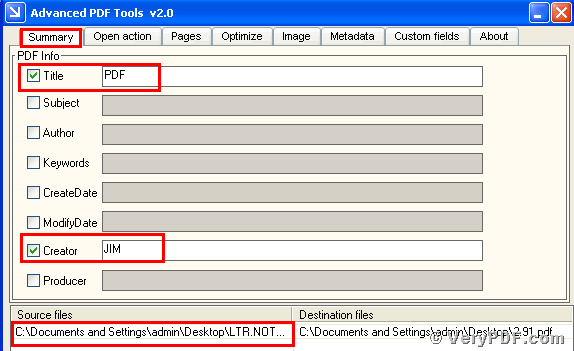 Let this software run, and move your pdf file (LTR.NOTE.ADDITIONAL.TERMS.pdf) into this program. Click the label page “Summary”, respectively check the box “PDF” and “Creator”. Then separately input the “PDF”, “JIM” into the matched light bar. At last, save the change. Please look at picture 1. 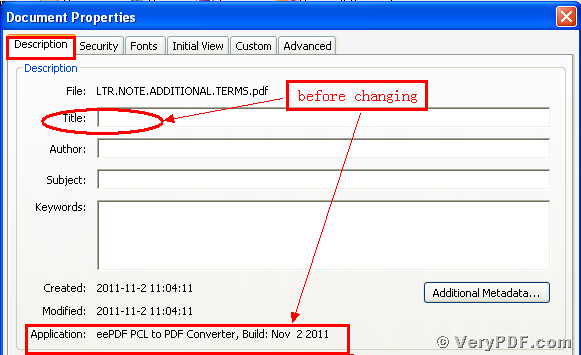 Separately open the changed pdf file (2.91) and the before changing file(LTR.NOTE.ADDITIONAL.TERMS.pdf). Then respectively hit the properties of the files. In the label page “description”, you can find that we had already edited pdf title and creator information by using the Advanced PDF Tools. I also give you two screenshots to show the difference. Please look at picture 2 and picture 3. So if you want to edit your pdf title and creator information, you can operate it step by step according to my explanation. If you read my article carefully, I am sure that you can gradually master this function. If you still have doubts, this website: http://www.verypdf.com can offer you more articles. This entry was posted in Advanced PDF Tools and tagged Advanced PDF Tools, edit pdf title. Bookmark the permalink.